Using only the numbers 1 through 9, complete the grid so that no number is repeated in any row, column or grid. Each puzzle has one, and only one, unique solution, and each can be solved using pure logic - guessing and trial-and-error are never required. Four new printable sudoku puzzles will be made available every day, directly from this page. Two will be "Easy to Medium" difficulty - the other two will be "Challenging" or "Fiendish". Choose the puzzle that best suits your solving level. If you can't wait until tomorrow for your next sudoku fix, check out Sudokus.tv and solve more than 120,000 unique puzzles online. 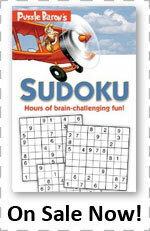 Play for fun or solve competitively to make it into the Sudoku Hall of Fame! If you're new to sudoku, or just looking for a relatively easy puzzle to solve, give these a try first. These puzzles have a much higher completion average and can usually be solved without too much difficulty. Seasoned solvers and those looking for a greater challenge will want to try these puzzles, which offer a bit more in the difficulty department. These puzzles are successfully solved less than 40% of the time, so get ready for a challenge!